I finished my first Summer Book-a-Day today! 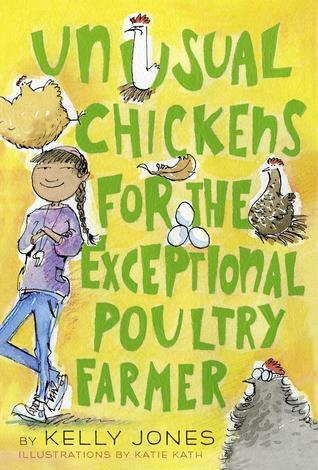 I read Unusual Chickens for the Exceptional Poultry Farmer by Kelly Jones. This book definitely has one of the strangest titles I've ever seen, but it is such a good story! When I first started reading it, I assumed it was realistic fiction...but it's not! It has a tiny bit of fantasy - so I think it would be considered Magical Realism. Kind of like All the Answers by Kate Messner or Bigger Than A Breadbox by Laurel Snyder. In the story, Sophie and her mom and dad have just moved to the country from Los Angeles. They inherited her great uncle's farm - but none of them know ANYTHING about farming. While her mom is busy writing magazine articles and her dad is looking for a job, Sophie begins to explore the farm. Tucked away behind some piles of junk, she finds her first "unusual chicken". Throw in a few more unusual chickens, a chicken thief, and mysterious letters and tips from a chicken expert - and you have a great book! I loved Sophie and her enthusiasm for trying and learning new things! I like how the entire story is told in letters. Sophie is feeling lonely in this new place, so she writes to her grandmother, who has passed away, to tell her all about what is going on in her new life. She also writes to her great-uncle to tell him what is happening on the farm - and ask him questions - even though she knows she won't get a response. And she writes to Agnes - who is supposedly the expert on "unusual chickens". This is a great book for kids who like to read books with unusual and interesting formats - and the illustrations are hilarious too! I will definitely be getting a copy of this for my classroom next fall - I think book clubs would have a good time trying to figure out what is going on! My current read is The Misadventures of the Family Fletcher by Dana Alison Levy. What are you reading?